← Gen and Kevin got married! So when I was at that impossibly wonderful wedding a couple weeks ago, I had an epiphany: northern Michigan is basically the best-kept secret ever. The lake beaches are cleaner than the ocean beach, the water seemed bluer, it wasn’t hot, there were no overcrowded roads or obnoxious beach stores with neon lights, and lighthouses dotted the aspen covered hills. Basically, I spent the whole drive having spasms over how I lived in Michigan for 4 years and never made it to the lovely northern coast. Before going to Frankfort for Gen’s wedding, my road-trip companion Jenny and I decided to go to Traverse City. 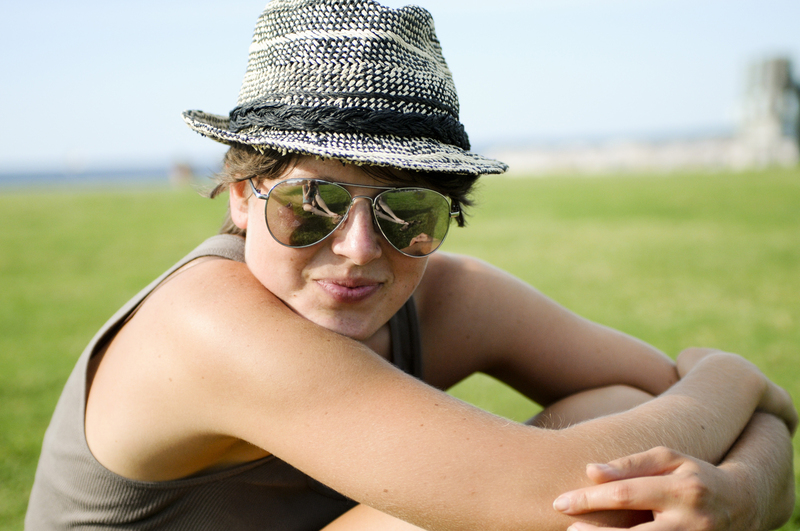 Traverse City is, from what I can gather, the hub for cool people who like to wear awesome clothes, eat healthy foods, and blog. It is where cool people live like Megan of The Fresh Exchange, or Jonathan of Culture Keeper. Confession: I am not a cool person. How do I know this? Because I proudly own 5 Celine Dion CD’s (including the Christmas special) and I love movies starring Mel Gibson, preferably where he is in any sort of costume. Don’t be a hater. I would pick Braveheart over an artsy movie with no plot and obscure music any day. But I went to Traverse City anyways and tried to not draw too much attention to my un-cool self. And people, you all need to stop what you are doing NOW and plan a trip to northern Michigan (in the summer, duh.) and stop at Traverse City, home of The Most Free Samples Ever. 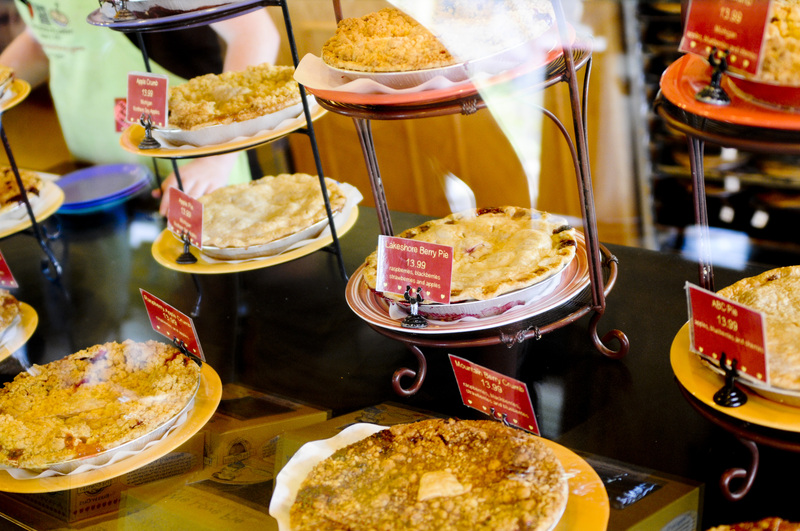 First stop, Grand Traverse Pie Company, where Jenny and I had peach cherry pie. There is no picture of the actual pie because it was consumed too fast and with too much glee to have time to photograph. This is Jenny post-pie consumption though, and she is indeed pretty happy. 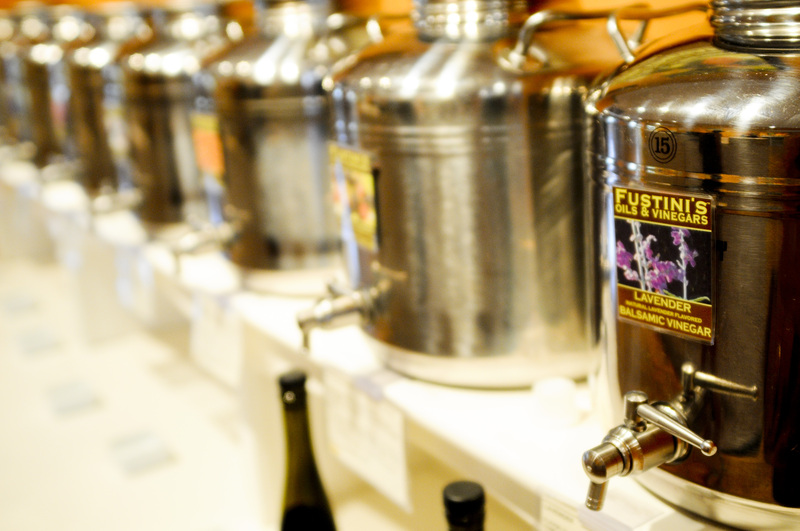 Second stop, Fustini’s, home of a bazillion special balsamic vinegars and olive oils. Did you know they make a balsamic that tastes like chocolate? Or Coffee? Or Peach? Or LAVENDER ? OR FIG??? ( And yes, I of course bought the fig, because you know how I love them.) Jenny and I probably spent 45 minutes sampling like pros until we were raving and insisting that we could taste the “bouquet of aftertastes.” While we were become veritable connoisseurs , the saleslady made a list of places to go and eat. Because people in Traverse City are not only cool, but super nice. Third stop, The Cherry Republic. For those who don’t know (as in, me, a couple weeks ago), most of the nation’s cherries come from northern Michigan. Translation: Traverse City is an edible shrine to cherry goodness. In The Cherry Republic, we were able to sample every variety of cherry product: chocolate covered cherries, cherry salsa, cherry dusted tortilla chips (why yes, I do now require all my munchies dusted in cherry! ), cherry jam, cherry chutney, cherry trail mix, etc. Furthermore, the chirpy saleslady informed me that anything in the store could be opened and sampled and I am pretty sure I abused that policy. 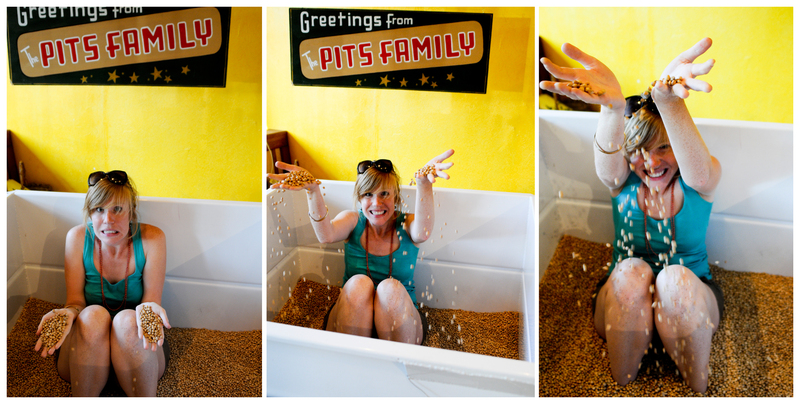 I then further blew my cool cover by jumping in the giant bin of cherry pits to have my picture taken. After our cherry binge, Jenny and I finished our Traverse City tour off with dinner at 7 Monks. Once again, no pictures because we were stuffing our face with food, as if we hadn’t just eaten every cherry product imaginable. And it was awesome. Just like Traverse City. This entry was posted in Uncategorized and tagged adventures, friends, photography, summer, travel. Bookmark the permalink. Right on, Hannah! Northern Michigan is the best! And not only are there cherries and other delicious items, the landscape is also dotted with great wineries, too. It’s practically a summertime paradise. You know I seem to recall telling you and all of the photo students to get out of Hillsdale and travel around Michigan, glad to see you finally did so. Angela and I actually bought a house in Traverse City last winter, so I guess I’m cool. You are SO cool. And yes, I should have heeded your advice earlier! If you happen to be back for Homecoming I have a solo show in the Sage gallery, stop by. Totally an incentive to make it back!!! I randomly wound up looking at your most recent blog post because of a facebook post by someone i’ll be going to college with in the fall.. funny that i randomly chose july 2012 in your archives when i saw Traverse City! I live in Benzie County, work in Frankfort 😀 Glad you got to experience northern Michigan (just don’t ever come back for the winter months!) SO RANDOM.